In early September I start googling weather predictions for Vanderbilt, Michigan in hopes of cold weather for the trout closer, with rain. Maybe I jinxed it. This may go on record as the hottest September ever with temps in the 90’s. Global warming? Camping was tough. The only way to cool off was diving in Pickerel lake. Or setting up a lawn chair right in the water. Feral devised a minnow trap so we had bait for fishing. 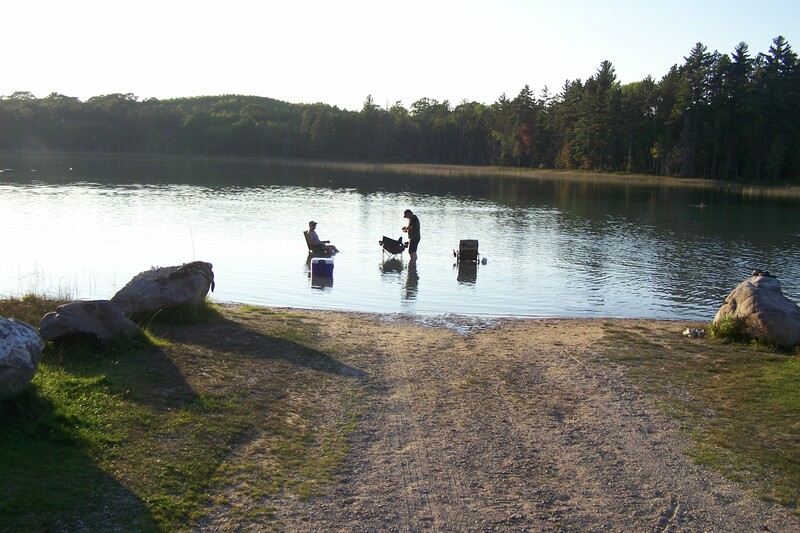 Pickerel lake has bass, bluegill, perch, and planted rainbow trout. 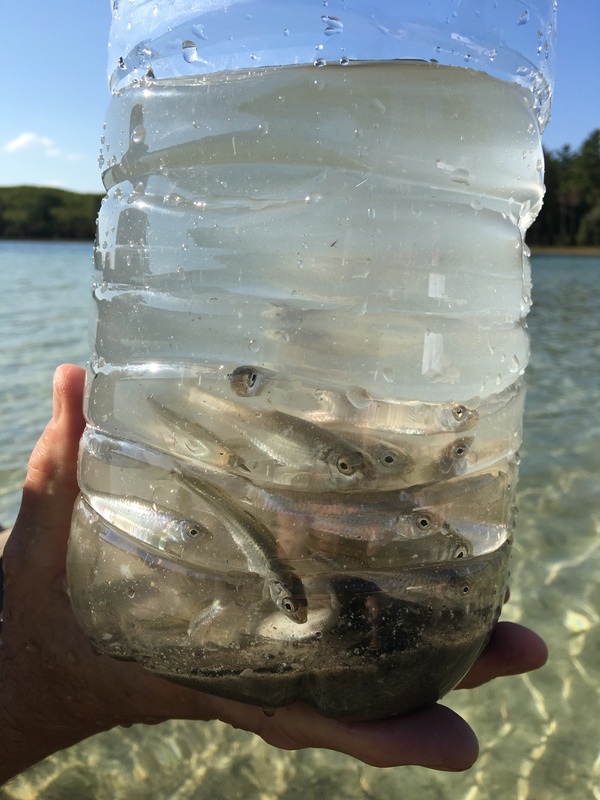 We caught bass and perch, but minnows are a top bait for most everything. We did catch a few stream trout. Natch caught a couple dinner size browns, Feral maybe no, I caught a small brown and a fat rainbow about 17 inches. We worked the streams early AM but that didn’t help much. 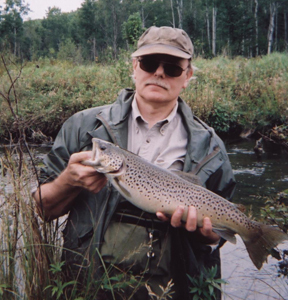 Normally big brown trout come up the Sturgeon and Pigeon rivers in the late fall to spawn… but it takes cold weather and rain. Feral tried partridge hunting with his 22 but failed to see any on a 5 mile hike down the road and around the lake. 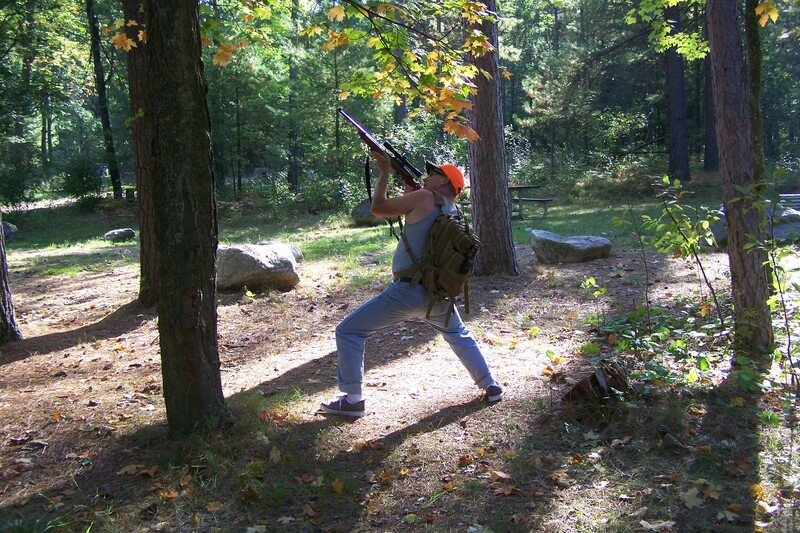 He later commented that he should have taken two beers instead of his 22, he would have shot just as many. We stayed up pretty late every night and had a couple good guitar/mandolin/bongo jams. I learned a new song on guitar for the closer, “Everybody wants to rule the world.” Somehow the lyrics seem fitting for the political chaos going on, even though the words are pretty abstract. Feral did some impressive triple picking on the mandolin. Natch provided some rhythm which was impressive too, considering he was going back and forth drinking bottled White Russians and Bud Light all night. It may have been a political statement whereby he effectively diluted USSR influence on US politics. Regardless, the man has an iron stomach. We packed up on Monday, a day ahead of schedule. We couldn’t face another afternoon of the blistering heat! Natch has this annoying habit of out-fishing Feral and I… and now he’s dragging his son into the picture! Following story by Natch. 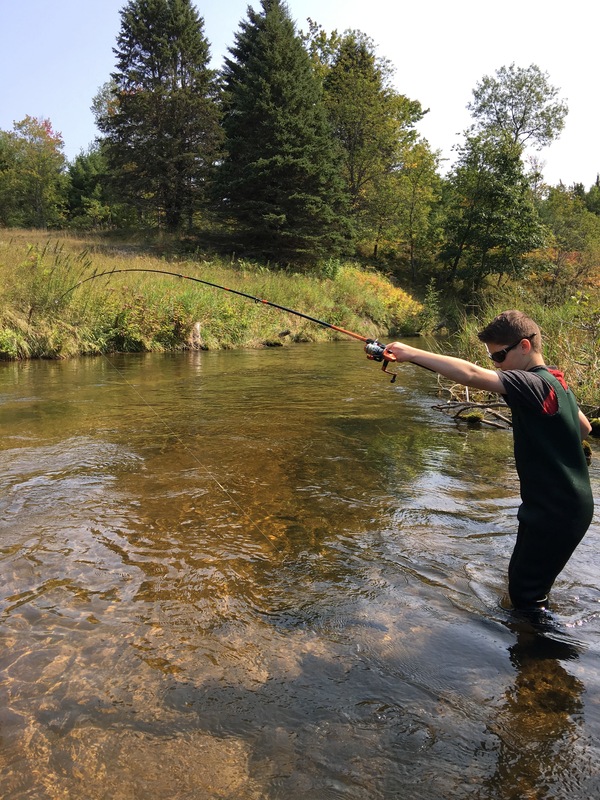 Trout report from up north this past weekend: Lucas (13) and I went up north to get some work done on our cabin but he convinced me to hit a trout stream instead. Day One, Stretch Number One: First, we hit the Manistee River south of CR612 along Goose Creek State Campground. The plan was I would fish in the stream and he would follow/fish from the bank since he didn’t have waders. 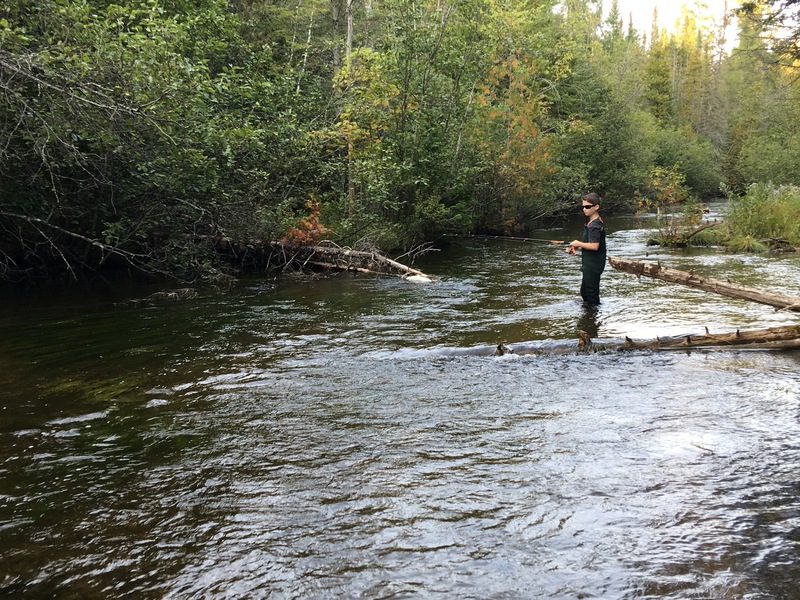 We saw a couple of small browns follow our lures but no real action – until some canoers & kayakers came along. I decided to get out of the way and up on the inside bank of the bend and enjoy the show. I could hear them coming for several bends up stream. The middle canoe, with two ladies, decided they couldn’t make the turn and go under a fallen tree that went all the way across the stream. Their choice – let the current ram them up against the tree and tip their canoe. Nice. The good Samaritan that I am, I waited for them to both get wet before I waded over to drag their canoe out of the water, empty it, and help them get back on course. After this excitement I had Lucas cut through the woods to meet me around a couple of bends. We met up on a long, sandy stretch. He decided he didn’t like me being the only one having fun in the stream so he proceeded to wade into the river with jeans and indoor soccer shoes. After about 15 minutes of that and no fish to show for it, he decided the water was getting rather cold. We agreed that since it was only around 3:00 we should run to Jay’s in Gaylord and see if they had any waders his size. Out of the river, through the woods and to the truck we went. An hour later we were at Jay’s trying on waders. We found some Caddis neoprene stocking foot waders that fit just about right with some room to grow if needed. Now we had to find some boots. I really didn’t want to drop big bucks on wading boots that he might outgrow by next spring so we headed to Walmart for some inexpensive hiking boots. Day One, Stretch Number Two: There was still plenty of daylight so we headed out to find a stretch to rip off and try out his new waders. We decided to hit Kolka creek in Frederic. It is a bit smaller and shallower water so I figured it was perfect for him to get his wading legs under him and see what he could do. On top of that, I’ve crossed that stream at least a 50 times a year for the past 15 years and kept telling myself I should jump in and give it a whirl. What better time than now? Let’s do it. We pulled way down a two-track to get to the stream and proceeded to put our waders on. Time to get in the water. We noticed a lot of bug activity on top of the water. The stream is shallow but there is some nice cover and rocky bottom. 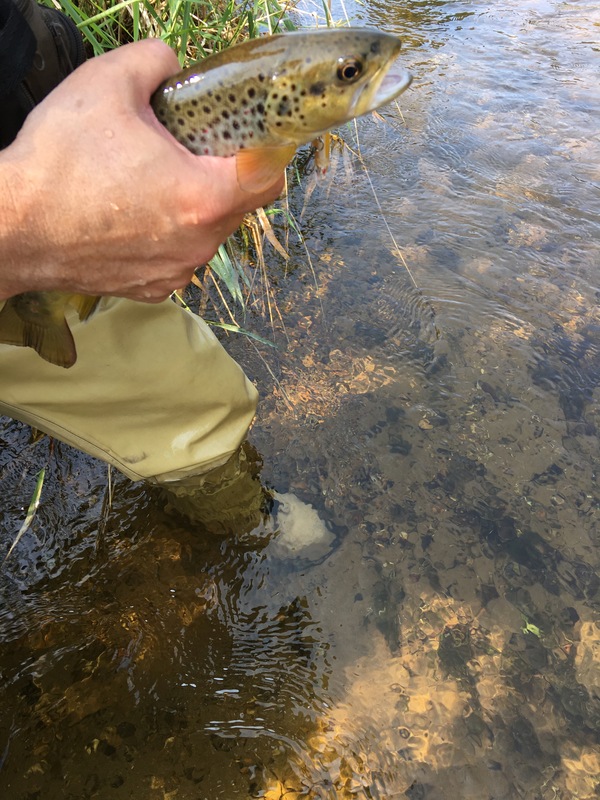 We saw a couple of small trout follow our lures back but I was only able to catch a 10″ brown. We ended up catching up to another fisherman so we decided to head back to the truck and hit a different river since there was still some daylight left. Day One, Stretch Number Three: We had about an hour or so of daylight left so we hit the Manistee River again – this time closer to our cabin and quite a ways upstream from our first stretch of the day. We hopped in the river and proceeded to cast all of the holes and cover. We had a few come out and give it a thought but they weren’t overly aggressive. We pushed on upstream. Lucas wanted to keep going even though the sun was getting lower and lower. I kept reminding him that we needed to get back to the truck with a little bit of daylight to guide us out. 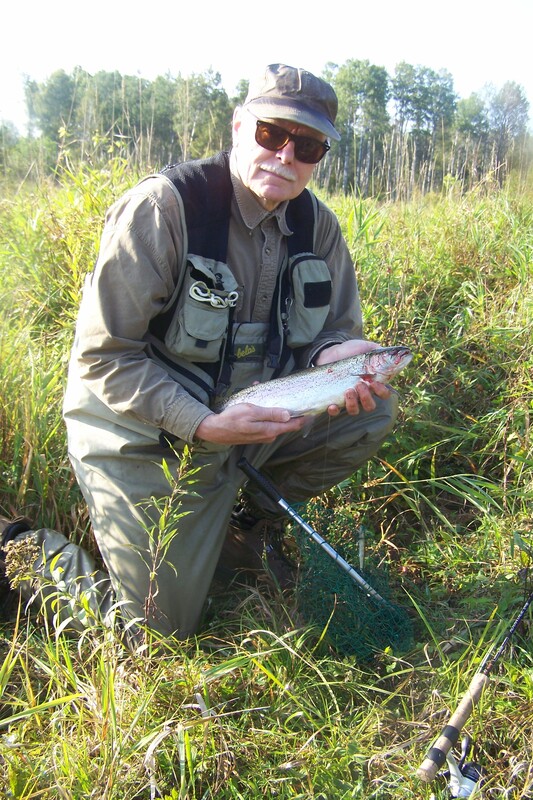 We cast several nice-looking areas but we could only pull out another 10″-12″ brown. Time to head back to the truck and rest up for tomorrow. Day Two, Stretch Number One: Back to the same stretch we left off the night before. We had better luck today. 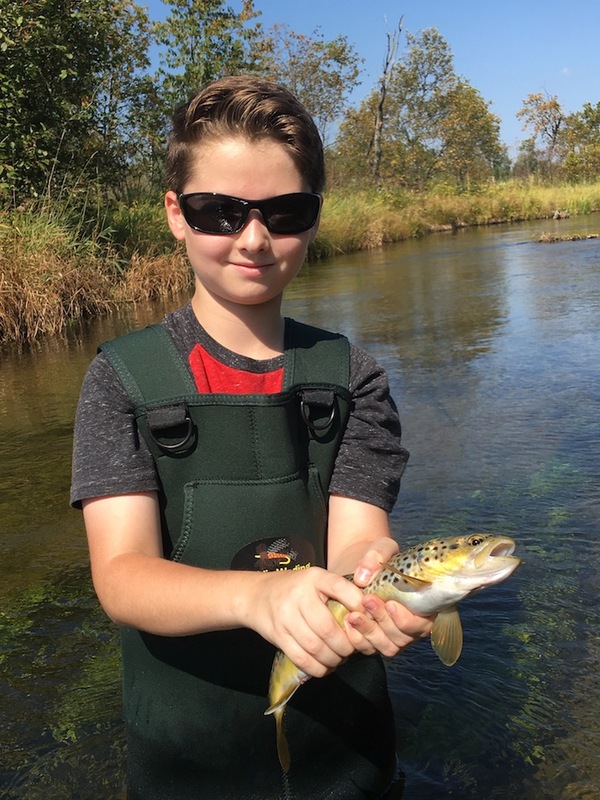 We were seeing more and Lucas caught his first brown trout – a 13″ beauty. I took the hooks out and handed it to him so I could get a photo of him holding it, but my warning of ‘they are very slippery’ wasn’t convincing enough I guess. No sooner did I grab my phone to take a pic and the brown squirmed his way out of Lucas’ hands and into the stream. Good thing Lucas took a pic of it right after I took the hooks out. Onward and upward to the next hole. 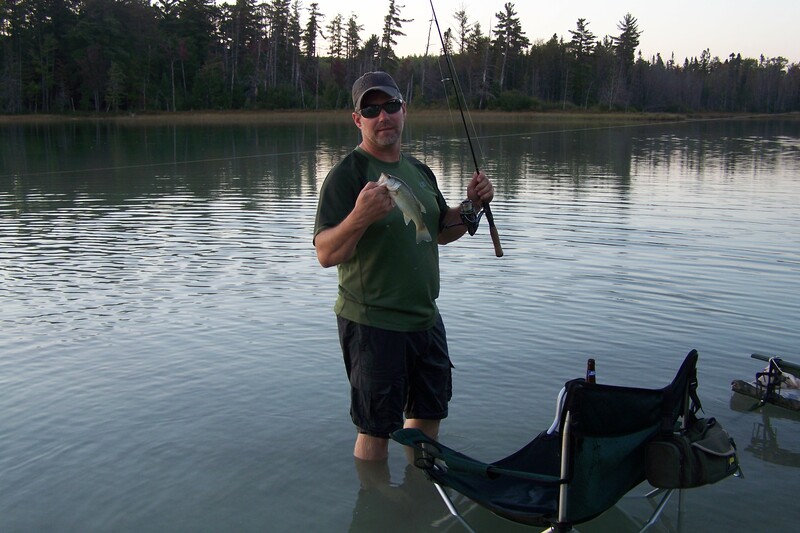 I ended up catching a couple more, a 10″ and a 16-1/2″ brown as we progressed through our 3-1/2 hour stretch. I am still amazed Lucas made it that far because that’s about all I can take for a single stretch. It took us nearly an hour just to get back to the truck (fishing here and there of course). One week later.. 15-3/4 ” brown trout, way to go Lucas! Big Leverentz campground was full except for a tiny site sandwiched between others and campsite 2 which overlooks the parking area but offers some sense of remoteness, like the corner table in a restaurant. I brought a guitar and a mandolin and when Feral and I camp there’s a pretty good chance we’ll knock down a few beers and jam. Having a remote spot is good since there’s less chance we’ll disturb other campers. Conversely, other campers sometimes stop by to listen and sometimes we get surprised by very talented musicians that want to jam. I stopped at a garage sale earlier in the week and found a pretty nice camp cot for ten bucks. I have one already so I called Feral to see if he was interested. He was so when I packed for the trip I grabbed an old tent large enough for two cots so he could try it out. The tent is made from thin nylon material and I had a vague recollection it may not be good in the rain so I checked the weather report before heading north. Weather dot com said 20% chance of rain and which I took to mean a 20% chance of rain rather than rain 20% of the time. The fishing on Levernetz was good, pike and bass. Late afternoon it clouded up and around six some light rain went through. Feral and I set up a tarp between trees to provide a shelter for our camp chairs. The rain stopped and we cooked some hot dogs over charcoal to get something warm in our bellies. Beer was good, and we had plenty. We jammed till about midnight and from this high point on a hill we could see other campfires die out as we delved deeper and deeper into our catalog of obscure folk and rock songs. Then the rain hit. We packed up the instruments and ran for the tent. My pillows were wet and I had a small puddle in the middle of my sleeping bag. This must have been from the earlier rain. Not a good sign since it was now pouring. Feral fared slightly better. The top corner of his bag was damp but the main body was dry. A puddle had formed near the door so we had to climb on to the cots and remove our boots carefully. I managed to get comfortable because one half of one pillow was dry. I fell asleep but woke up an hour or two later because the beer pressure was rising. My left arm was soaked which explained why I was a bit cold. I went out to find a tree and when I returned I lifted the sagging bulges from inside the tent and was rewarded by the ploosh sound of water cascading over the tent walls. I woke up at 7:00 and was not shy about getting up (and letting Feral sleep in). He heard me rustle and asked if it was time to get up. Yes. Feral had a tough night. Water dripped constantly on his head. 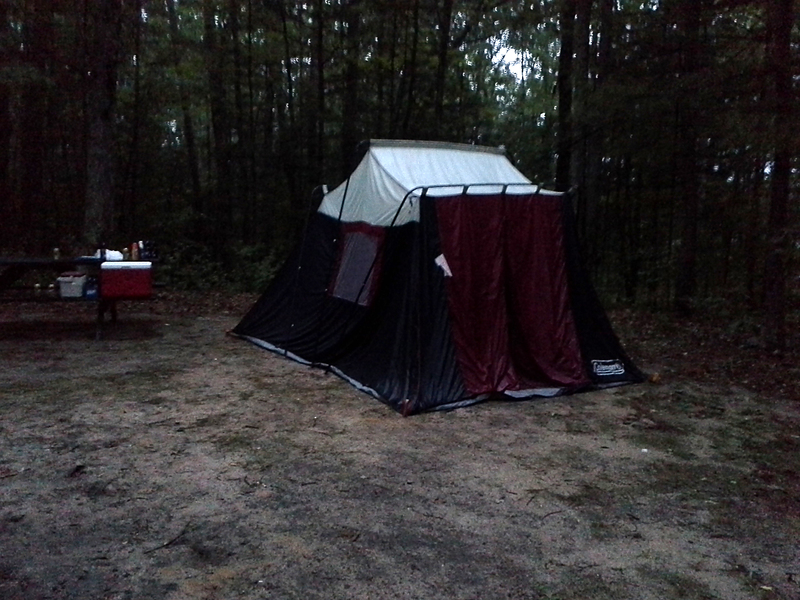 The rain had stopped and we had planned to break camp early as we both had things planned for Labor day. So we packed up quick. If you are fast there is a nice cabin tent at campsite 2, Leverentz Lake that is just the thing in dry weather.